Ready to try making restaurant-style fresh ramen at home? It’s easier than you think. Here we introduce recipes to upgrade two of Japan’s favorite ramen flavors: soy sauce and tonkotsu pork broth. Whip them up in your own kitchen and upgrade your bowl of basic ramen to new flavor-rich culinary heights! Shoyu (soy sauce) ramen broth is probably the most basic broth that’s easiest to play with. 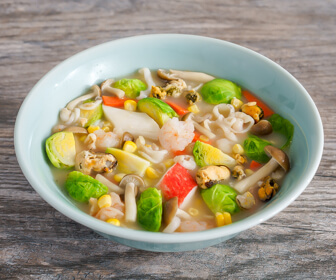 Even though the broth is already full of flavor, there are many toppings that are traditionally added to this dish to give it even more. These additions include scallions, hard-boiled egg, nori seaweed and chashu, which is made from fatty cuts of slow-braised pork. Together with ramen chef Akira of Brooklyn Ramen in New York City, we introduce Tan Tan noodles recipes using Hakubaku’s fresh ramen noodle kit. Hakubaku’s kit includes fresh noodles that can be stored at room temperature. They are very different from the typical dried noodles you find in other instant noodles, and they taste much closer to restaurant-quality noodles. You can simply cook noodles in two minutes, and the kit comes with broth base so all you need are the ramen toppings. What Is Tan Tan Noodles? 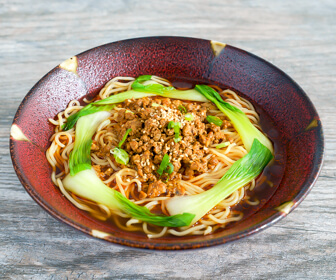 Tan Tan noodles originated in China’s Sichuan region. But in China, people don’t usually eat Tan Tan noodles with soup. However, when people started making Tan Tan noodles in Japan, they started making it with soup and turned it into a traditional bowl of ramen. Cut bok choy into bite size pieces and quickly boil for a minute. Drain. Boil about 2 cups of water in a small pot. Add ground chicken and cook until chicken are done, about 2 minutes. Place boiled meat to a pan. Keep the stock. Add sweet bean paste, white sesame paste, grated ginger and grated garlic to the meat. Stir fry over high heat until cooked through, about 3 minutes. Add Hakubaku’s soy sauce ramen soup base, chili oil, and scallions to a medium bowl. Reheat the chicken stock over high heat and bring to boil. Skim off any foam and pour 1 ¼ cup of the stock into the bowl and mix well. Boil Hakubaku’s fresh ramen noodles for 2 minutes in plenty of water then drain. Place the boiled noodles to the serving bowl. Pour ramen broth, and top it with the bok choy and ground chicken. Sprinkle sansho Japanese pepper if you like. Make sure to boil the bok choy thoroughly so it blends in with the rest of the ingredients and is not still hard and chewy. Then drain it well to remove excess moisture. Do NOT overcook the ground chicken. Doing so will make it dry and chewy and also ruin the overall ramen flavor and experience. Before adding chicken stock to the soup base, reheat it and bring it to a boil. Also skim off any extra foam before adding other ingredients. Doing this will ensure the soup is clear and appetizing. This recipe is Chef Akira’s original Japanese-style Tan Tan noodles. He recommends making ramen toppings and the broth simultaneously to save time. Tonkotsu is a type of ramen broth made from pork bone or marrow. It’s a creamy and rich broth that gives the soup dish a full flavor and serves as a base so full of umami that not many spices need to be added. But there are many different toppings that go well with Tonkotsu Pork Ramen, including sesame seeds, pickled ginger, hard-boiled egg, chashu and wood ear mushrooms, which have a specific crunchy texture and earthy taste. Together with ramen chef Akira, we also introduce Champon noodles recipes using Hakubaku’s fresh ramen noodle kit’s Tonkotsu flavor, which makes this dish much easier to prepare at home. The word Champon means mixture of everything. Japan’s Champon originated in Nagasaki, but there are many varieties of Champon in several other parts of the country. Champon typically features chicken broth, but in our recipe, we are going to explore Champon with Tonkotsu broth to create one of the most satisfying restaurant-style ramen soups you will ever try. Cut shimeji mushrooms and finely chop Brussels sprouts. Defrost seafood mix according to the instruction on the package. Place defrosted seafood mix, carrots, shimeji mushrooms, and Brussels sprouts to the deep frying pan and stir fry with vegetable oil over high heat for about 3 minutes until cooked through. Add tonkotsu ramen soup base to the pan and blend thoroughly, then add 1 ¼ cup of boiling water to the pan. Mix well. Boil plenty of water in a small pot and cook Hakubaku’s fresh ramen noodles for 2 minutes. Drain. Place the boiled noodles to a serving bowl and add sesame oil, then pour in the stir-fried ingredients and soup. Make sure to defrost the frozen seafood mix before you stir fry it with the other ingredients. Sometimes the ice attached to the frozen seafood mix has a fishy flavor. You don’t want to have that in your ramen! Brussels sprouts are harder to cook through. Chopping them into small pieces is the key to getting a better consistency in less time. Champon noodles are typically made with chicken soup, but this recipe uses Tonkotsu to add a different flavor. Hakubaku has been a leading company in grain and grain-processed products in Japan since 1941. Hakubaku, which means “white barely,” refers to the delicious but healthy staple grain products that are an essential part of the Japanese diet and now are available around the world. It creates quality grain-processed products such as authentic Japanese noodles, mixed grains teas and flour products for both restaurants and households while exploring new possibilities of grains every day.